Having a garden where everything is in harmony is what I aspire to and what I would hope my readers are looking for, also. Can you imagine having beneficial insects just show up on their own and take out the annoying insects without you having to even think about it? That’s what happens in my garden. 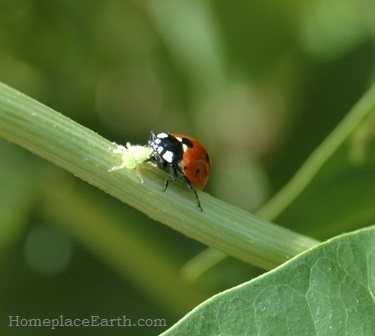 In the photo you can see a ladybug eating an aphid. I happened to be in the garden with the camera at the right time to catch that. I found that action on a cowpea plant. I have also found ladybugs on my rye plants when they were flowering. You can tell they are in flower by the pollen bits that are hanging off the potential seed head. I plant those crops both as food for our table and as cover crops for food for the soil. The most basic thing to remember about having a healthy garden is to Feed the Soil and Build the Ecosystem. When you do that, all sorts of wonderful happens in your garden. Make sure you don’t use any chemicals, even a little bit. That would set your efforts back tremendously. Be alert to the fact that even chemicals that may be allowed under organic certification under certain circumstances could be harmful to the beneficials you hope to attract. Feeding the soil to produce healthy plants is your first protection against insect and disease damage. Healthy plants are less attractive to the harmful insects. 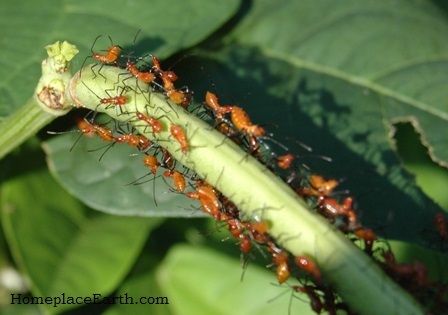 Cowpeas must be good for attracting the right kind of insects because I’ve also seen Assassin Bugs, also known as Wheel Bugs, on my cowpea plants. Here is a photo of the Assassin bug nymphs that I found in my garden on a cowpea plant. There was an adult with them, which was a help with the identification. To identify insects I usually turn to Insects, Disease, and Weed I.D. Guide, edited by Jill Jesiolowski Cebenko and Deborah L. Martin for Rodale Press. According to that book “adults and nymphs are voracious predators that feed on both larvae and adult insects, including aphids, beetles, caterpillars, flies, and leafhoppers.” When you find an unfamiliar insect in your garden, identify it before you decide to harm it. If you are looking for a perennial to plant to attract beneficials without having to replant each year, put in tansy. Tansy is in the aster family, which is known for attracting good insects. Other Aster family members are cosmos, sunflowers, zinnias, and chamomile. In her book Great Garden Companions, Sally Jean Cunningham refers to tansy as “probably the single best attractor for beneficial insects.” When I took a two week permaculture design course in 2006 at Three Sisters Farm in Pennsylvania, Darrell Frye was proud of his Tansy Tangle, as he called it. Once it flowers, tansy can look quite wild when it leans over from the weight of the flowers. Darrell had corralled it with a few fence posts and string to hold it up. At home we have tansy growing across the back of the porch. I have a tendency to let things be more on the wild side than my husband, who has the urge to get the clippers when things look too messy. My remedy to that is to cut some early at the base and it will grow back and bloom again as shorter plants. By the time it is growing back, the rest needs a good trimming, but that’s okay, because I have that early cutting growing back. What I don’t like is if it is cut all at one time. That leaves nothing for the insects. Plants in the carrot family, such as dill, angelica, caraway, lovage, fennel, and coriander, and in the mint family (spearmint, bee balm, and catnip) all contribute to attracting insects beneficial to your garden. You need to let them flower in order to attract those beneficials. Attracting beneficial insects can be as easy as letting some of your basil flower. Pollinators are good to attract to your garden. Although honeybees get most of the attention, there are many other insects that act as pollinators. I was surprised by the amount of water honeybees need in the summer. When I saw my honeybees at my neighbor’s garden fountain I realized I should give them some water closer to home, so I put up a birdbath. Sometimes in June I find it necessary to fill it three times a day! 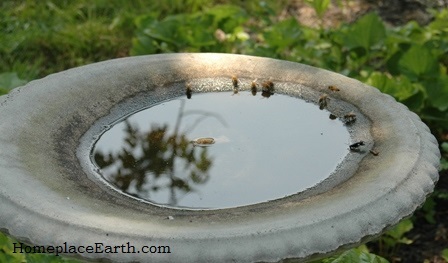 You can see in the photo that my birdbath has a shallow bowl where the bees can wade in on the edge. If they tried to get water from a deep dish, they would drown. I bought the birdbath with the bees in mind and put it in a flower bed. Of course, it also attracts birds and they are a joy to watch. Birds can be beneficial helpers in your garden by eating pest insects and slugs. Posts or other objects in your garden will give them a place to land and watch for their prey. Have a sit spot for yourself so you can watch them in action. Trellises you may have for your vegetables can serve as resting spots for the birds. Birdhouses on the perimeter add interest to your garden and a place for permanent or seasonal residence for your feathered friends. Insects need more than plants to keep them around. They need places to live. You can provide habitat for them by providing cover in your paths. Planting white clover there or having mulch, such as leaves, will do for that. If you till your garden all at once, it is like cutting all the tansy at once—there is no place for the insects to go. Having permanent beds and permanent paths contributes to building your ecosystem. Having shady places among your plants and spots left wild, such as weedy fencerows sometimes are, also help the ecosystem. You can attract toads this way. Water spots close to ground level will please them. There is so much more to learn about attracting beneficials to your garden and you will find some great ideas by searching for information on companion planting. Keep in mind that if you relax, plant a variety of plants, and provide the right habitat, Mother Nature will step in to help you out.